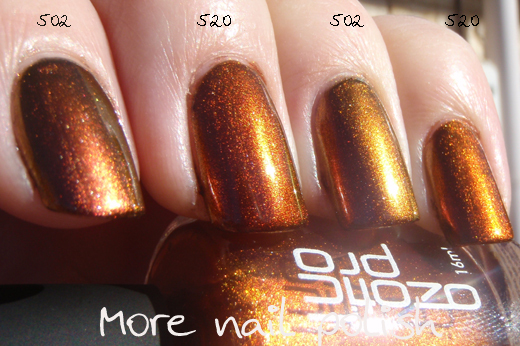 Another comparison today, this time between Oztoic 502 Sands and Ozotic 520 Molten. In the bottle these two do look quite different. 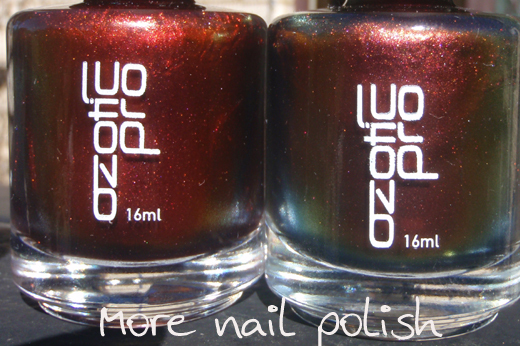 Sands on the right shows more duochrome colours around the edge of the bottle. 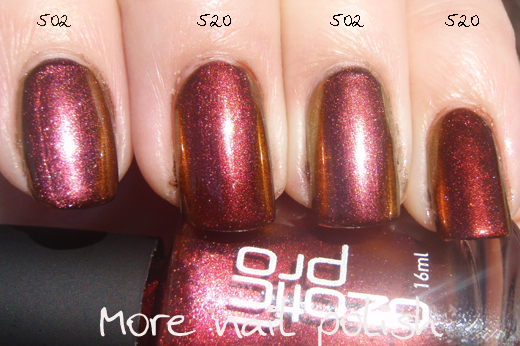 Here is a swatch of both colours, two coats over black, in the shade outside. I had a hard time picking between these colours in the shade. But when you see them in the sun, you can see the difference. 520 Molten is redder, where 502 Sands is pinker. Here is the orange shift, which is similar, but not identical. This comparison shows it best. 520 Molten has a burnt orange finish, whereas 502 Sand is more of a green yellow finish. When I wore these seperately, I thought they were dupy, except that I preferred Molten on me. Which was silly given they were both so similar. But because I preferred one over the other I thought there had to be a difference. And there was. i love 520, but 502 seems a bit ashy. maybe it's just me, or it compared side by side with 520. At least we know we don't have to buy the two of them!! I really cant see any different until the final image. Too close to call. Thanks for doing this. I want to order from the Aussie company that will ship internationally on this brand but I sure don't want to end up with some oops of being too close in the shades. I am with Courteney on liking 520 over 502 due to the ashy in 502. Just ordered 502 today and I can't wait to see it!